Deliver Spas quickly, safely, and easily through narrow spaces! Anyone in the spa business knows that access can often be limited when jockeying a spa into position for installation. Though it is a simple matter to set a spa directly from our SpaDolly™ trailer, there will be times when there is just not room for this to happen. The function of our SpaKart™ is to offer a high degree of maneuverability while carrying a spa on edge in order to make it through narrow spaces. It will easily roll over gravel or soft lawns with no problems. The SpaKart™ can be steered from either end or from both ends. This feature allows the SpaKart™ to pivot within a very short turning radius. The pin that holds the handle in place on each axle can be used to lock the steering if desired. When you understand how the SpaDolly™ and SpaKart™ work together you will really appreciate the innovation built into our Spa Handling System. The spa is easily loaded onto the SpaKart™ using the SpaDolly™ Trailer. Just insert the axles into the SpaKart frame carried on the rear of the SpaDolly™. Stand the trailer up to the 45 degree position. Push on the top edge of the spa. It and the SpaKart™ will pivot on the brackets holding the SpaKart™ frame. When the spa reaches the vertical position it will already be sitting on the SpaKart™. Pull the trailer away and the brackets slip out of the SpaKart frame to leave the spa and SpaKart™ standing alone. One person can load a spa that is sitting on its base using the hand winch to pull the spa up the front of the trailer. A spa can also be unloaded to its base by sliding it off of the front of the trailer. One person can load a spa that is sitting on its edge from the rear of the SpaDolly™. The spa unloads to its edge from the rear of the trailer, as well. 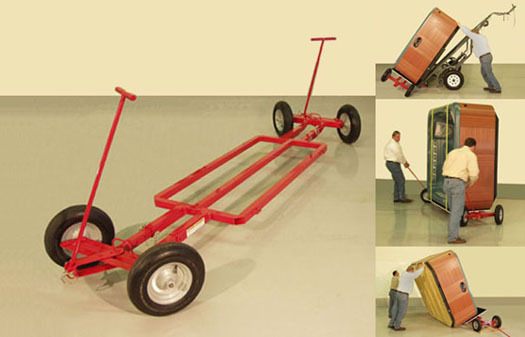 The SpaDolly™ trailer can also be loaded and unloaded with a forklift. Approach the trailer from the rear where the frame is configured to allow for the forks to clear once the spa is in place.